General Description. The genus Pyemotes includes polixenous or monoxenous insect parasites exhibiting a wide variety of morphological polymorphisms. Some species of Pyemotes are natural enemies of forest insects or stored product insects. The genus is divided into two groups, scolyti and ventricosus (Cross et al., 1981). Species of the scolyti group are phoretic on bark beetles (Scolytidae). At least one female morph is a phoretomorph. Phoretomorphic females are shorter than "normal" females and much broader, with thickened legs and enlarged claws. There are also two morphs in the male of Pyetomotes dimorphus Cross et Moser, 1975: "normal" and heteromorphic. The latter morph is distinctly larger, with many greatly enlarged setae, and sometimes setae are duplicated. The mites feed only on bark beetle brood or on immatures of other beetles in the subcortical habitats; none feeds on adults. They are relatively "venomless" and the host remaining alive for about a day after the initial attack (Cross and Moser, 1975). Species of the ventricosus group are not known to be phoretic, and thus females are monomorphic. At least some species possess venom. 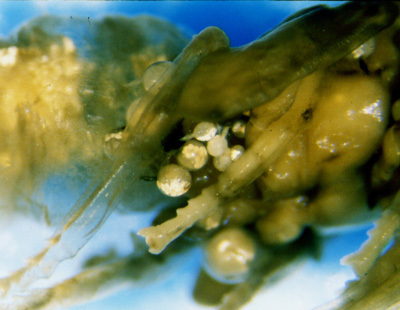 The mites inject venom into prey, which causes paralisis and eventual death (Krczal, 1957). The host range includes a variety of hosts, and some species even attack and feed on pupae and adult insects. The bites of Pyemotes tritici (Lagrèze-Fossot et Montané, 1851) can cause severe dermatitis on people handling infested material such as hay. 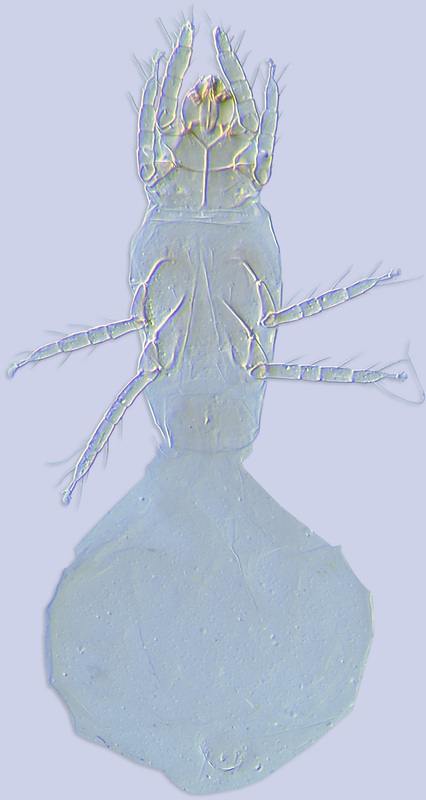 Contact with this mite can also produce asthma or nausea. Records of Pyemotes from bees include Pyemotes ventricosus (Newport, 1850) from Anthophora retusa (Apidae) in England (Newport, 1850), Pyemotes anobii Krczal, 1957 from a colony of the European honey bee, Apis mellifera (Apidae) in the United States (Cross and Moser, 1975), Pyemotes beckeri Krczal, 1957 (as ventricosus) from laboratory cultures of megachilid bees (Krombein, 1967), and Pyemotes herfsi (Oudemans, 1936) from hives of Apis cerana in India (Dinabandhoo and Dogra, 1982). 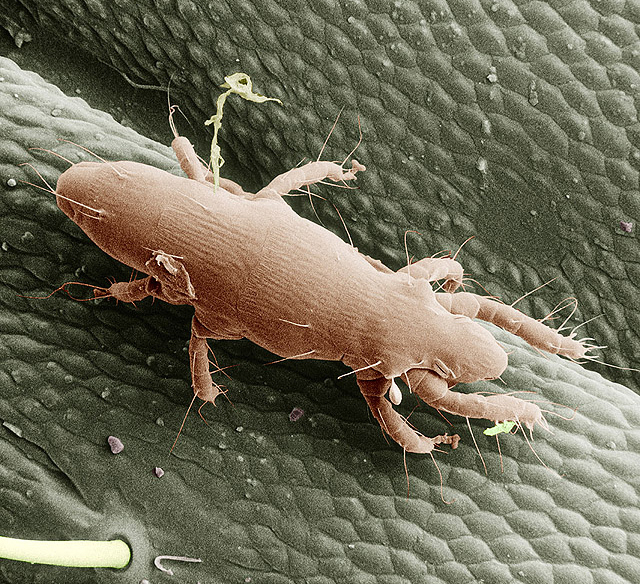 In the latter case, the mites were considered as pests. In Brazil, Pyemotes tritici (LaGrèze-Fossat & Montagné, 1851) can destroy entire colonies of stingless bees (Tetragonisca angustula, Frieseomelitta varia , Melipona subnitida, Melipona asilvai ) and cause skin irritation in beekeepers (Menezes at al., 2009; Kerr at al., 1996; Nogueira-Neto, 1997). Pyemotes ventricosus, the type species of the genus, is poorly described and probably has been misidentified by subsequent workers. Oudemans (1937) speculated that the fungal disease of the bee larvae reported by Frison (1923) for Anthophora abrupta in the United States, is in fact physogastric females of Pyemotes ventricosus. Cross and Moser (1975) suggested that this species is only known from the original description and has never been recollected. - Hysterosomal setae c2 distinctly smaller than d or e. Length of third and second prodorsal setae variable. * Modified from Cross et al. (1981). In all species in the key the fourth prodorsal pair of setae being distinctly thinner than setae d and e.